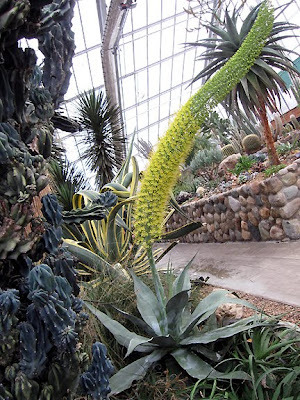 One of the century plants at Matthaei Botanical Gardens is blooming. I've seen this Agave pedunculifera many times in Matthaei's conservatory, but never before in bloom. It starts blooming from the base of the flower to the top. While others were still buds. And many were in fun stages in between. 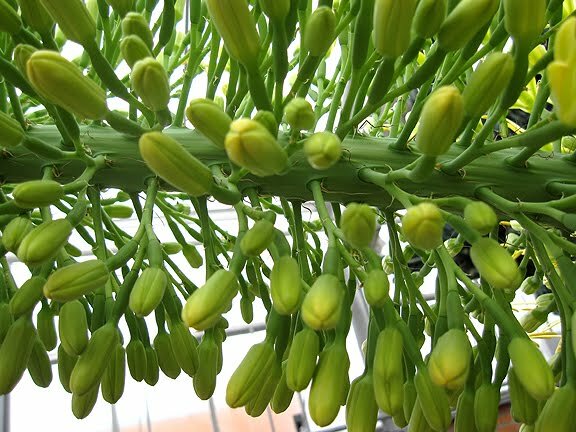 The blooming up the stalk goes very quickly. It moved a few inches in under 24 hours. It's a very impressive flower, but I also love the foliage. 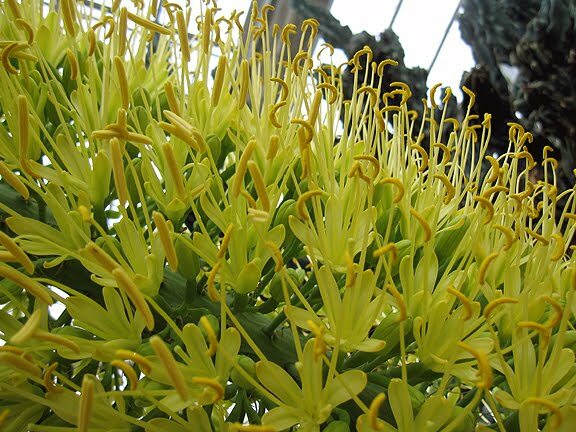 The plant doesn't really require 100 years to bloom, but a good, long time. The jury was out on how exactly how long--I was told 15, 25, and 45 years--but there was consensus that this plant came to Matthaei as a pup from the parent plant originally donated to Matthaei at the old location on Iroquois. After an agave blooms (similar to yucca), it dies. It send up a new plant, the pup, which eventually produces a stalk. 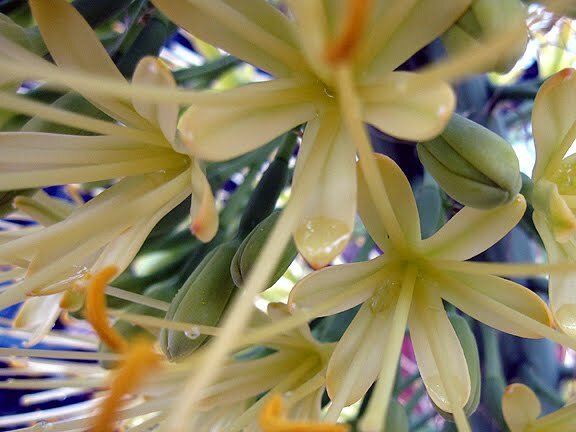 The agave nectar (see the droplet?) is sweet (I tried it. It is.) and apparently sold as an alternative to sugar as it doesn't spike blood sugar levels. I was glad to be able to see it bloom. If you're in the area, swing by. The blooms should hold out for while. Lucky you getting to see this beauty. Wish I could see it too. What a plant! Interesting pictures. 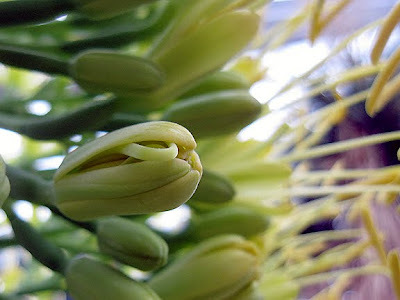 Great close-ups; these blooms are so fascinating! 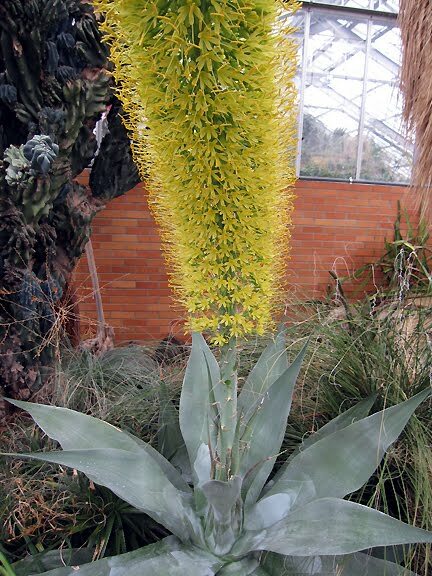 I saw an agave in bloom on my first trip to Phoenix' botanical garden, but I couldn't get up close and personal to see it as well as this one. Our guide there told us the agave would die once it finished blooming; will this one as well? Wishing you and your furry friends a very Merry Christmas, Monica! 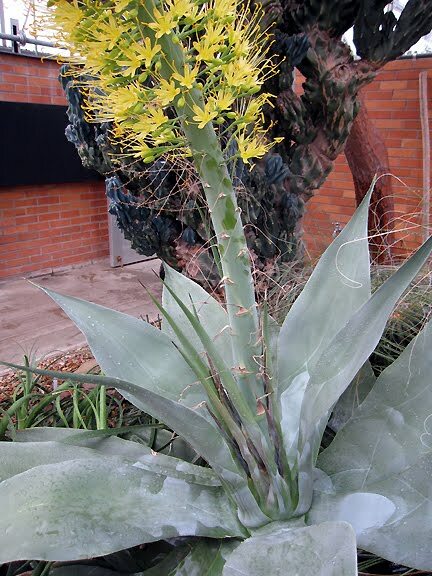 That's actually Agave pedunculifera in bloom. A. bracteosa is the small clump in the foreground in your second picture. For some reason they pulled the tag for pedunculifera after it started blooming and tied it to one of the leaves where you can't see it. 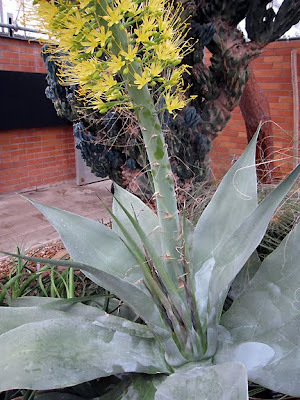 Yes, the agave will die, but offsets usually form around the base. 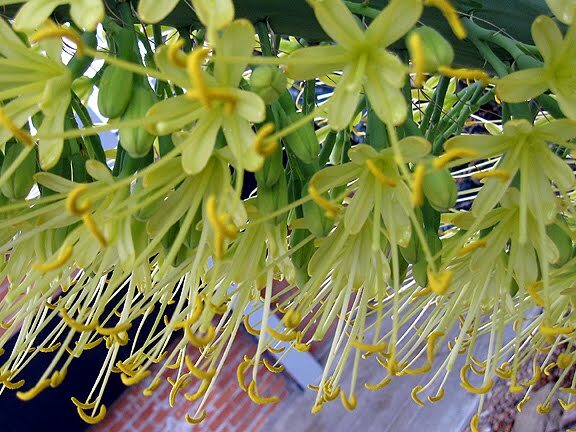 This particular species was first introduced to horticulture by the U of M in 1940, so as it blooms and dies about once every 20 years, they've always been sure to replace it. Wow, great you showed the bloom. It's very beautiful and impressive! That's so cool! Was the bloom fragrant? I use agave nectar in my coffee every morning, it's the only natural sweetener that I've found not to have a weird aftertaste. 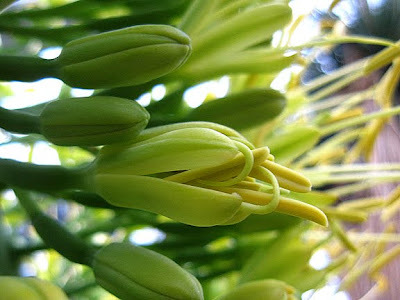 Lovely flowers, indeed an exceptional plant. 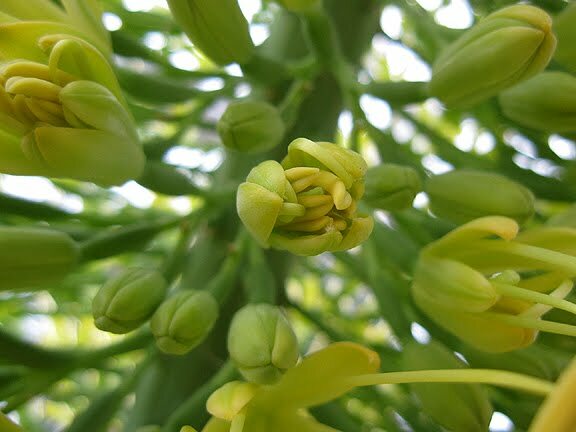 As the blooming up the stalk goes very quickly.